The following post is part of a series from one of our LSAT tutoring clients. You can read about their experiences by clicking on the "Zen Journal" label above. Welcome to my statistics week blog! I'd like to extend the topic matter just a tad into the territory of probability--that is, probability of getting into your top law school choices. I will further demonstrate a Zen of 180 goal-setting exercise that uses probability. I will be taking the personal view, in other words. If you have further questions on the standardized bell-curve or the different percentile marks, I refer to you to Mr. Bennett. Law School Probability calculator is another website we will be using today. The sparsely-designed web tool has you enter your GPA and LSAT score, and then choose whether or not you are an underrepresented minority. It then computes the individual likelihood of getting into 200 different law schools (using a regression model and statistics from lawschoolnumbers.com). The calculator returns 200 different decimal probabilities, one for each law school. I enter a 3.96 GPA and a 168 LSAT score (I'm not a URM) and I'm immediately told that I have an .11, or 11%, chance of getting into Yale, but a 59% chance of getting into Cal-Berkeley. A number of schools like NYU, Harvard, and Michigan fall in between. A couple of notes: first of all these are just estimates based on limited variables (GPA, LSAT, and minority status). For this reason, Zen of 180 tends to look at the numbers returned by the calculator not as strict probabilities, but as an indicator of how good your soft factors must be. If I have an 11% chance of getting into Yale, I simply need to have better soft factors than 89% percent (100% minus the 11% I beat out with my LSAT/GPA one-two combo) of the applicants with my same data or better. Second, what is all this speculation about anyway? This, afterall, is only somewhat focused on applying to law school after you have received your LSAT score. Zen of 180 shows you how to master the LSAT. I for, one, have not recorded a score of 168 except on my most recent pratice LSAT. What gives? When I wrote to Zen of 180 about my personal possibility of rising to a certain score and being admitted to a certain school, I was already tired and confused by the contradictory information regarding what scale score I needed to get into what school. The average advisor had a tendency to give unhelpful absolutist declarations ("You'll never get into Harvard with a 167," etc.) Before laying the groundwork for studying and tracking, Zen of 180 pointed me to Law School Probability Calculator with a set of directions that I will recount below. Next, I essentially did the same thing with potential scores, I tiered them into dream, content-with, and bottom-level scores. 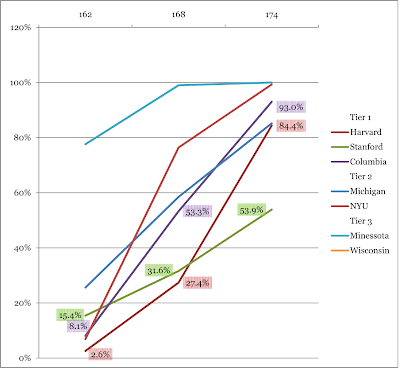 Zen of 180 advised me to keep this data in a spreadsheet--tiered schools vertically, tiered scores horizontally. Then I entered each of my tiered, potential scores into Law School Calculator, using my actual GPA and non-minority status. In my spreadsheet I recorded the probability of getting into my different schools if I applied with each of my tiered LSAT scores. From that list of probabilities, you are free to set your own specific goals. I took away just as much from observing how improvements in my LSAT score, moving up the tiers so to speak, improved the chances of my admission into top choice schools. The largest shocker for me was how a jump of six scale points from 162 to 168 increased my likelihood of admission 7-fold. Raw numbers though they were, I was immediately inspired to dive into my study and start acceding tiers.